On May 2014, a block of rock weighing two tonnes fell from a slope above the spring close to the Interpretation Centre for Groundwater, forcing access to the source of the Arteta to be closed to the public for the following four years. This is an area near Pamplona that had attracted a large number of tourists. Our Dynamic Barriers were chosen to stabilize the slope and to protect pedestrians and the facilities from any future rockfalls enabling it to open again. Arteta’s spring, or Arteta’s source, is located in the Ollo valley, at 30 km from Pamplona and is one of the natural outlets of the interior aquifer of the Andía range, which stores the water that falls on an approximate surface of 100 km2. In a small area, the spring, the salt and the ravine of Artazul constitute an example of how water and the passage of time affects the rocks. During the last four years, this zone, which attracts a remarkable number of tourists, has had to remain closed to the public because of the numerous rockfall events that have occurred, endangering the safety of visitors and the integrity of the facilities. In that context, a project to repair and stabilize the right slope of the spring was redacted and tendered. On May 2017 the go-ahead was given to award the works to repair one of the slopes and prevent future rockfalls. 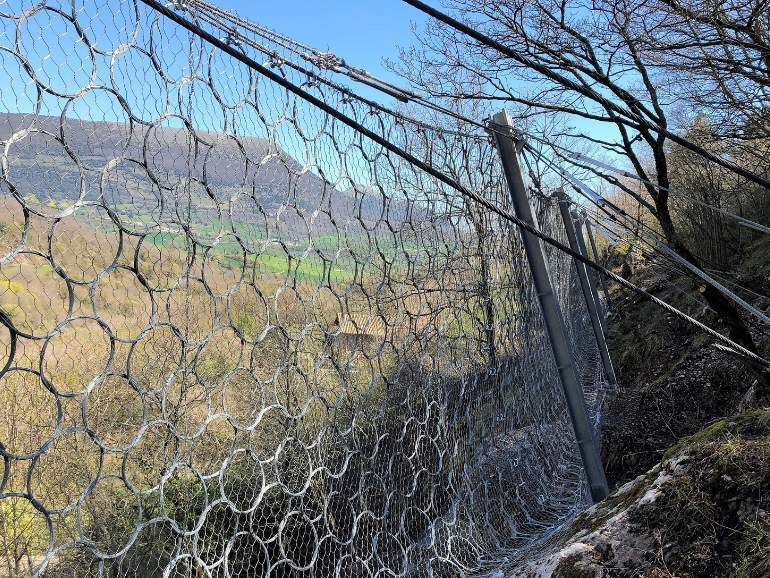 Maccaferri was chosen to provide technical advice and to supply the Dynamic Barriers to protect the zone. Due to the slope’s height and the variety of sizes of the blocks that were potentially unstable, two types of Dynamic Barriers were chosen to stop these blocks from falling near any of the pedestrian zones. In particular, 140 linear meters of RMC 200 barrier and 70 linear meters of RMC 500 barrier rockfall were installed. These barriers are capable of withstanding the impact of a rock block with energy levels in excess of 2000 kJ and 5000 kJ respectively. In addition, the blocks whose trajectories could fall outside the reach of the Dynamic Barriers, were covered with Double Twisted Wire Mesh 8×10-16 and reinforced with Rope Panel. Installation works were carried out between January and April 2018 by TALIO. Following the completion of the works, the Mancomunidad Association of the district of Pamplona reopened the Information Center and access to the area. For more information on this project, download our 00.